The electronic gift voucher containing a unique promotion code will be issued to the purchaser’s email address once payment is processed and approved. Book confidently knowing the best rate is here. Why not book direct rather than via a Third Party Booking Site? We guarantee the best online rate. Full range of rooms & availability, often not seen elsewhere. Personalise your stay with our little extras & packages. Ask about our discounted rates for 7+ nights stay. Guests currently staying in our villas will be given the option to vacate the property prior to 5pm the evening before the Code Red Day. Guests due to check-in on the Code Red Day will be called and advised that the accommodation will not be available and that Saltus Luxury Accommodation office will be closed. 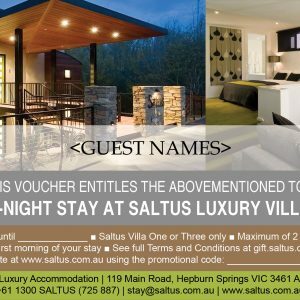 Guests who choose to leave their accommodation and those who have been advised not to attend will be issued with a gift voucher for a future stay equal in value to the balance of their stay (subject to availability) of the property at the time of re-booking. © 1997-2018 Saltus Luxury Accommodation. All rights reserved. 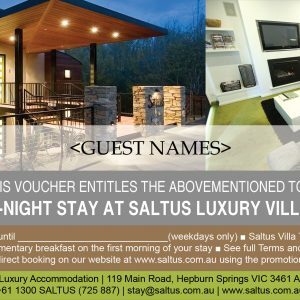 Visit Saltus for Luxury Daylesford Accommodation. Contact us today to book a relaxing break!